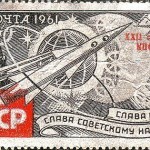 Soviet Space Exploration Stamps. 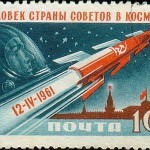 April 12, 1961 at 9 o’clock 07 minutes in the Soviet Union was launched into Earth orbit spacecraft “Vostok”. On board was the world’s first cosmonaut Yuri Gagarin. 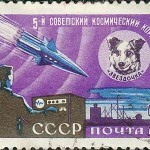 The next day, April 13, mail in the USSR and Czechoslovakia noted the milestone even by the releasing commemorative stamps. 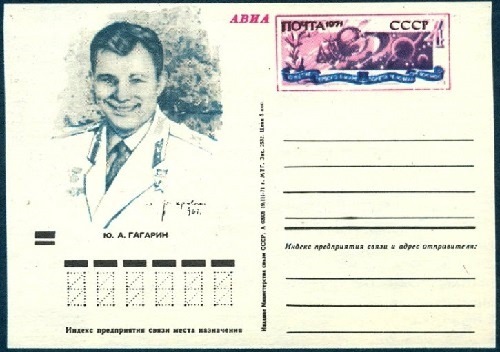 Philatelists to the day, know the hour of appearance of the first “Gagarin” post thumbnails. 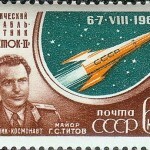 April 14 was released the second Soviet stamp dedicated to the astronaut, three days later – another, this time a portrait. April 25 was issued a commemorative stamp of Hungary, 26th – Bulgaria, the day after – Poland and so on … But so far it is not clear what stamp – Soviet or Czechoslovak – belongs to the leadership? 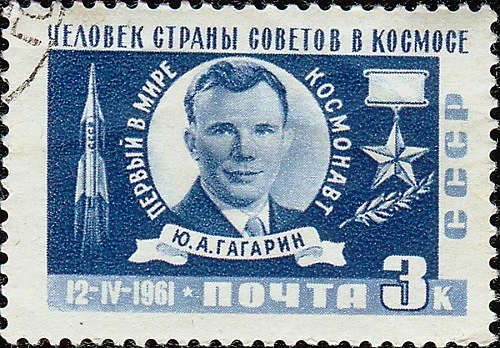 For both issues of stamps appeared about 24 hours after landing of Yuri Gagarin. 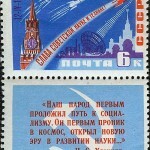 As for the Soviet “space” stamps, efficiency of issues is not surprising – they were printed offset, faster and cheaper. But in Czechoslovakia stamps, manufactured by tradition intaglio method, it is surprising. Their production is labor-intensive: the artist draws a sketch, and then the engraver transfers it onto metal. And only after that comes the turn of printers. However, such printing method enables rapid changes in the printing clichés. It is enough to remove a fragment of an inscription there, replace parts of drawing – and a new stamp is ready to be printed. That’s just used by the Czechoslovak printers, repeating the pattern of the previous brand, but inserting the new text and changing color. “Space” stamps made in intaglio method, were made in our country as well. They were not quite usual miniatures. They were issued on aluminum foil in 1961 and 1965 in honor of the Day of Astronautics. Before the artists of these stamps was put a difficult task: to convey the specificity of the image in the technique of engraving on metal. This printing method was justified. For example, if to turn the stamp, changing the angle of illumination, as on it appear the new details. The printers had problems as well: prints from the printing plate were made on a thin foil, which then ought to be stuck to the paper. Almost immediately after the landing of “Vostok”, artist A. Yar-Kravchenko began drawing the portrait of Yuri Gagarin. 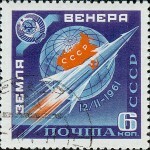 The drawing was finished to the tenth anniversary of the flight of “Vostok” on a memorial stamped card. This is the first in the Soviet Union postcard issued with the original drawing. 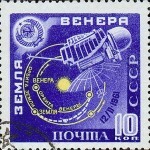 In 1957-1958, the sculpture by E. Vucetic “To the Stars” was reproduced in the series of stamps dedicated to the launch of the Earth’s second artificial satellite. 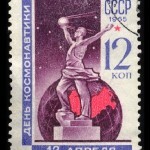 In 1961, one of post miniatures adorned the sculpture “To the Stars” by V. Postnikov. 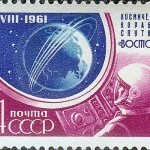 Another of his composition – “Into the Space!” is displayed in the philatelic series “Glory to Space conquerors!”. 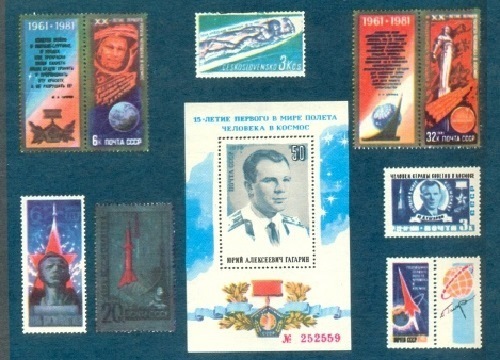 The stamp, which appeared to the Cosmonautics Day in 1975, reproduced a bust of astronaut, work by L. Kerbel, and on one of the coupons of Jubilee series of 1981 was reproduced installed in Moscow Monument to Yuri Gagarin made by P. Bondarenko.